Howards Citroen has finally moved into their brand new showroom alongside the stunning new Kia franchise. Customers will be offered an extremely plush while-you-wait service for MOTs in the re-vamped showroom in Weston-super-Mare. Customers can relax in the air-conditioned lounge area, which offers free WIFI, a 51-inch plasma screen television, and has a built-in complimentary drinks dispenser and water cooler. Howards have invested £100,000 in workshop equipment. There is also a dedicated DS area which displays Citroen’s premium brand spectacularly with the use of high-intensity lighting. 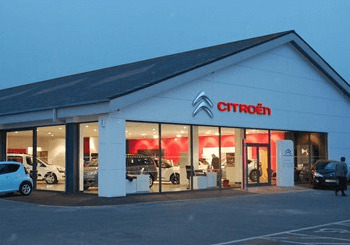 Other improvements included a new service reception area, expansion of the used car display area, extended servicing facilities and a brand new frontage.